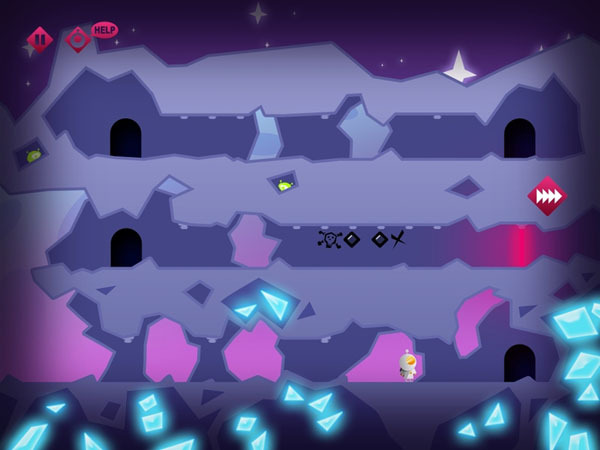 Tiny Space Adventure is an enjoyable puzzler experience for the mobile device. From its visuals and audio to the gameplay itself, the whole package can be surmised as being simplistic yet charming. An ever-increasingly difficult series of puzzle stages will have you growing challenged, frustrated and eventually glad you stuck it out and moved on to the next (even more difficult challenge). Unfortunately the game’s controls are a little awkward on smaller screens, but this is rectified by playing on an iPad. After being crash-landed on an alien planet, a lone astronaut needs to traverse the land and find his way home. On his way he will come across hostile aliens, dangerous traps and a world where just about everything is trying to kill him. The story is told through voiceless (and textless) almost comic-like cinematic sequences. While it is bare-bones at best, the game’s nature doesn’t really rely too heavily on a story and the game would be just as enjoyable even if it was a series of levels without anything tying them together. 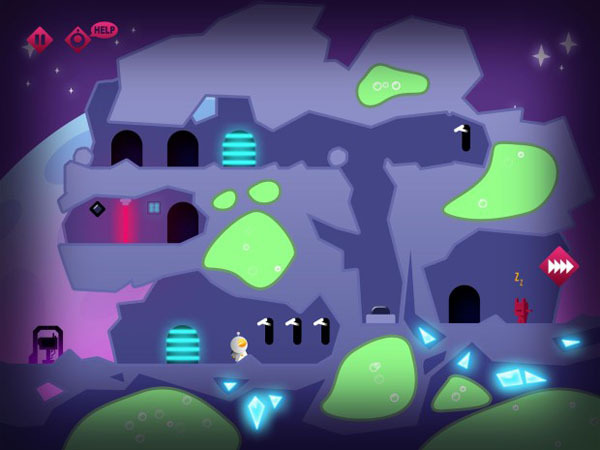 Tiny Space Adventure is a relatively simple point and click adventure/puzzle game. Your goal in each stage is to move your stranded astronaut through the perils and off to safety. You do this by pointing tapping where you want him to move, and then tapping to interact with any switches, boulders or other objects in the world. The puzzles are actually quite difficult, with even the beginning stages posing a very real challenge. 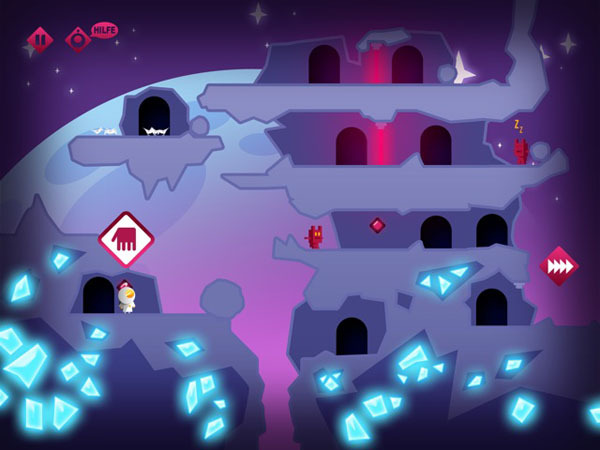 Also, like most other mobile games, there is also a 3-star system to completing the stages; each stage has 3 aliens to click on which will add to your overall score at the end of the level. The problem with the game’s point and click style is that the small screen of the iPhone and iPod makes for cumbersome and uneven gameplay. This is especially problematic as a lot of the puzzles are timing based or require you to move to a very specific location, so accidentally moving too far in one direction can (and often does) end up disastrously. The end result of this is a game where the deaths oftentimes feel unfair and cheap. Although it should be noted that this is a problem with the smaller-screened iDevices, and playing the game on iPad eliminates this problem completely. Simplistic is the best way to describe Tiny Space Adventure. 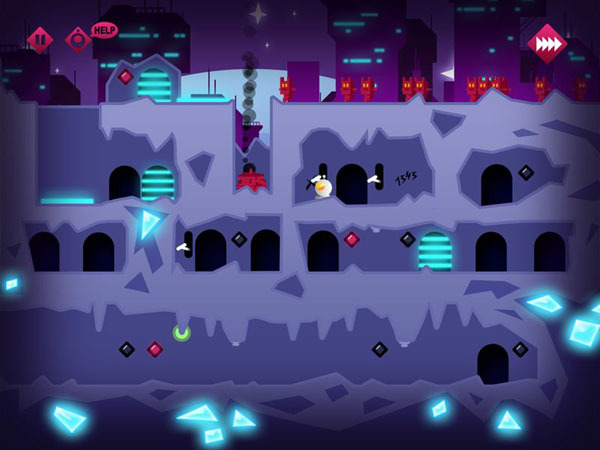 The whole game is presented in a very cartoony 2d environment with lots of simple shapes. This art style really works to give Tiny Space Adventure a unique feel among games of its genre. Everything looks well defined and there is little to no blurring or blending of the individual elements. The music is just as simplistic, featuring very up-beat, sci-fi tuned that are punctuated with small sound effects (most of which usually signify that you are about to die). Every sound effect is unique but still sticks to the game’s whole motif. The background music is present but there isn’t much too it to warrant paying attention to. All in all, while the game’s audio isn’t bad you don’t lose out on too much if you play the game on silent. 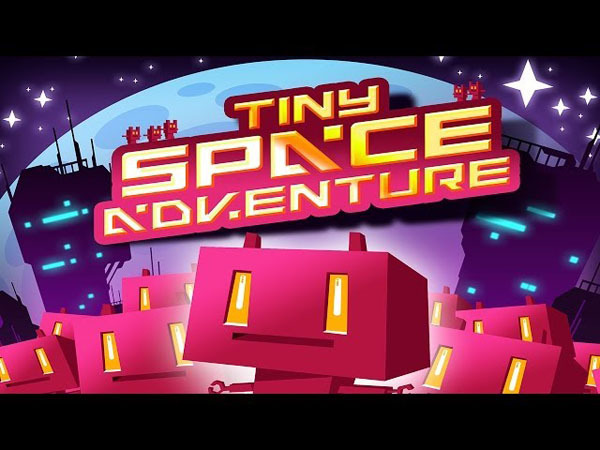 Tiny Space Adventure is the epitome of simplistic design, and it works to its advantage. The visuals and audio are all basic and lack real detail, but are well defined enough that they stand out among others in the genre. Despite its incredibly clumsy controls, Tiny Space Adventure offers a unique and challenging experience. be warned though, if you are the type that gets frustrated easily then you might want to give this one a miss, however if you can handle the challenge and are playing on a larger-screened device then you will definitely find something to like here.